To grow market share responsibly resulting in profit. To continue maintaining the "human touch" with those we deal with and to delight on a daily basis in our quest to deliver a professional and efficient service. Ilembe Technologies cc is a company made up of like minded individuals who saw a need to change the way the Information Technology Supplier sector interacts with Business. Ilembe Technologies has a combined 30 years worth of experience in IT, which enables us to offer first tier product with best practice technology to ensure the highest quality service to our clients. 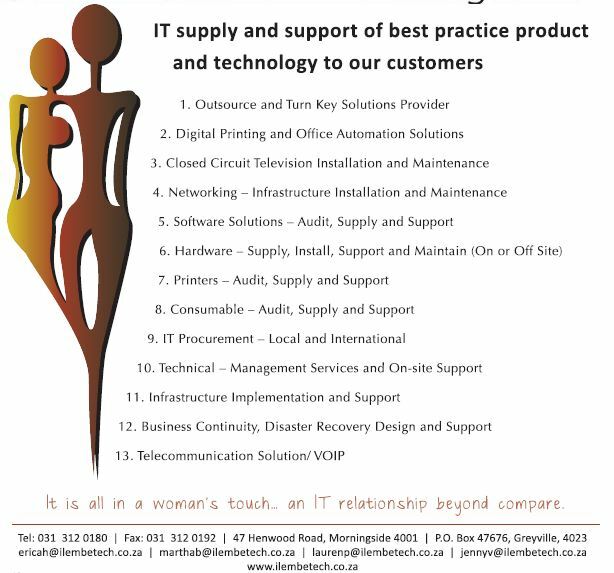 Ilembe Technologies cc has strong relationships with key Vendors, Distribution and Enterprise Channel partners alike, to ensure seamless supply and support of best practice product and technology to our customers. With these relationships firmly established, we are able to share resource and skill to support our clients no matter their requirement or location. Top Companies Publishing and Events is proud to inform you that Ilembe Technologies CC has been nominated as one of South Africa's Top Emerging Empowerment Companies in the Logistics Solutions sector by Impumelelo: South Africa's Top 300 Empowerment Companies, and will appear in the Emerging Empowerment Companies Section of the 2005/06 edition of this prestigious publication. Congratulations!